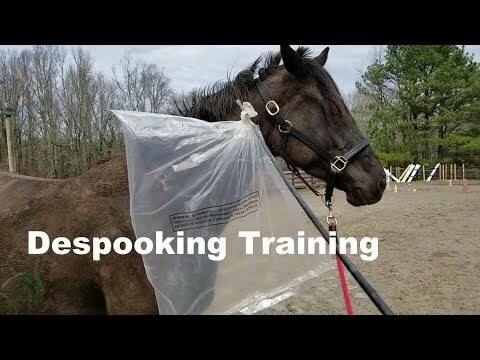 « Have You Seen Our YouTube Retraining Thoroughbreds Channel? 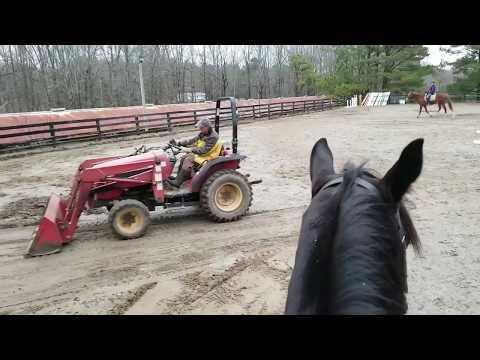 Made in Her Image came to Bits & Bytes Farm from the race track in mid-December 2018 for a few months of training. Her owner will be bringing ‘Mae’ home to Nantucket, MA in the spring. We have the pleasure of starting this three-year-old filly and documenting it. 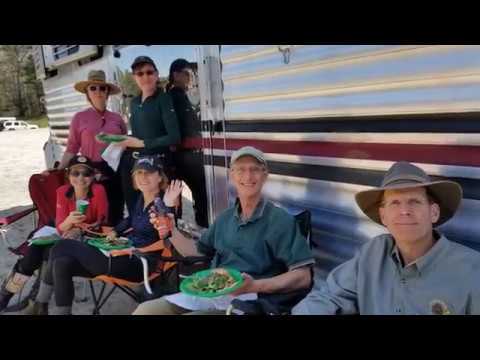 We hope that the videos will help others who are starting young Thoroughbreds off-the-track. Each of the videos has information about what we are working on. If time allows, we will add more information to this post. If you would like to see a diary of us retraining an ex-race horse, click on over to Reign Day’s Training Diary. You will find photos and information about how we start a Thoroughbred that has just come off-the-track. 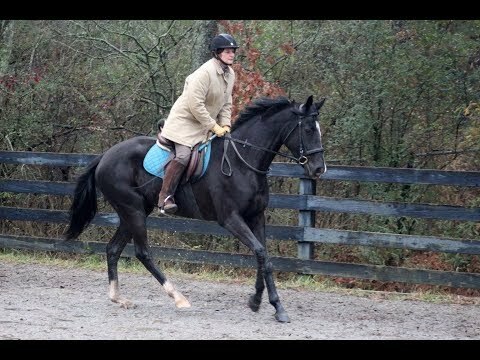 We have a YouTube channel with videos of the Thoroughbreds we have for sale, ones we have sold and training and outings videos of other Thoroughbreds. There are lots of fun videos to watch. It was a muddy messy Sunday and we spent much of the day working on the arena footing. We decided that it might be a good time to do some despooking training. 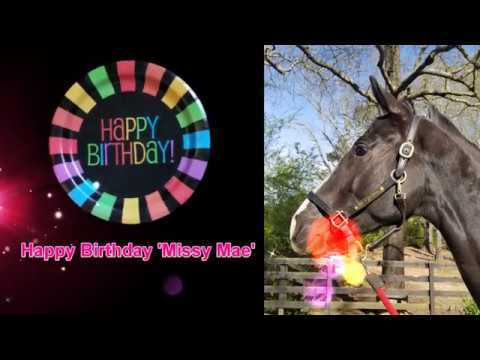 First Misty followed the arena harrow (see our Instagram page for the video) and then our horse in for training, Made In Her Image aka 'Mae', got exposed to the 'Evil Plastic Bag on a Whip', then the 'Hula Hoop of Horrors' and last of all the 'Big Blue Tarp'. The most scary thing of all for me, was how dirty she was. 'Mae' is pasture mates with Rocky Bear and I think Rocky has been letting 'Mae' into the puddle. When starting a young off-the-track Thoroughbred it is good to expose them to all kinds of experiences and noises. Made In Her Image met up with 40+ ROTC runners during her ride in the woods last week. Talk about a wall of energy coming at you...She stood quietly while trembling but waited for me to explain what we were going to do. I wasn't sure what we could do to avoid them so we waited and watched. We watched as they all came down the hill in a chanting pack only to turn and run back up the hill one-by-one. Thank goodness. We both breathed a sigh of relief and then continued our quiet ride back to the barn. Today we could hear the boys yelling in the distance. Not near as loud as when we meet them in the woods. 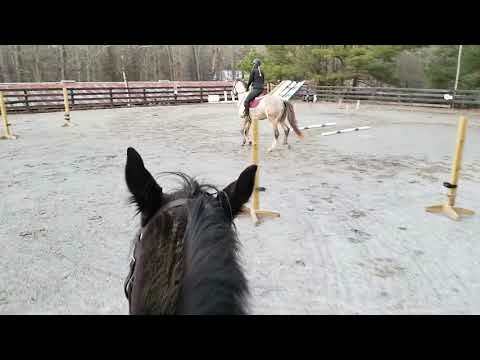 We also had construction going on at the school next to the arena and another horse schooling as well - so there were lots of distractions for a 3-year-old OTTB. You can see that 'Mae' handled it fine. She took her cue from me and the other horse. We did not react so there must not be anything to be afraid of. It was a busy weekend for Team Bits & Bytes Farm. Call Me Ferdie, Rowdy and George completed at the Chattahoochee Hills show on Saturday and on Sunday we did a 'Babies' lesson in learning to jump with our Team Leader Sarah Berhalter. 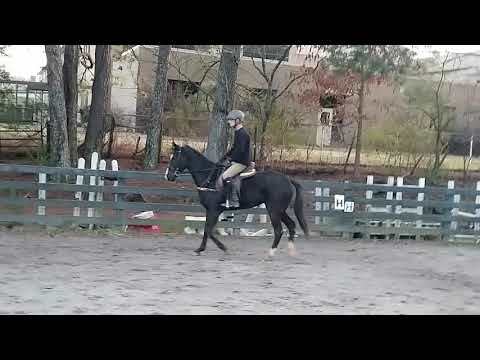 The purpose of doing ground pole work is to teach the horses that it is easy and fun to learn. They never are allowed to rush and they get lots of praise for their efforts. Slowly the jumps are built up from ground poles to single cross-rails to multiple cross-rails. It does not matter if they put their heads down to look or even stop and walk over the obstacle. We want them to have a consistent pace and to just take it slow. By giving them the time to figure it out, they do not get scared or rushed. This will pay off down the road when the obstacles get larger and the questions get more complicated. It is amazing how they figure out the exercise if we just take it slow and let them learn at their own pace. My favorite saying is, "You can never go to slow with the training but you can go too fast and scare the horse and yourself." Take your time and enjoy the process. It will pay off in the long run. Requested Update: Horses in the video: His Last Hurrah (Misty -grey), Made In Her Image (Mae - black 4 yo filly), Swear (Yes, Swear is his registered name aka 'The Flying Sausage' - dark bay star/white stocking) and C For Chant (dark bay with C on his forehead) who joined the baby lesson just to get some work in.